ALA Banned Book Week: Lots of interesting material for librarians to use to promote Banned Book Week—display ideas, activity ideas, a PSA script, a letter to the editor, a First Amendment Film Festival of suggested fiction and documentary films, and a list of banned books in 2011. Banned & Recovered: Artists Intervention—an online version of a traveling exhibition organized into four themed sections—Banning Books and the First Amendment at a Crossfire, Literary Works on Trial, Race, Gender and Justice, and Burning Books: The Extreme Ban. Thirty-seven contemporary artists created new works of art inspired by titles from the long list of banned and challenged books. In keeping with the theme “free people create freely,” participants were not hindered by restrictions or guidelines, but left to interpret their chosen title however they wished. The result is a spectacular collection of witty, whimsical, angry, and thought-provoking statements about the ramifications of censorship and the importance of free speech. Through original book art, mixed media, paintings, photographs, and multi-media art, this exhibition brings to light historic bannings and challenge attempts that continue to threaten our First Amendment rights today. This traveling exhibition was inspired by Banned & Recovered: Artists Respond to Censorship, which was on display at the San Francisco Center for the Book and the African American Museum and Library in Oakland in 2008. For viewing the gallery of images, you may find it easier on their flickr page. Authors of Mischief: an exhibition in Philadelphia in 2008. From the Canterbury Tales to Ulysses, the Rosenbach Museum & Library’s collection is full of books that have been banned, challenged or censored. To mark Banned Books Week, an annual celebration of the freedom to read, the museum will present Authors of Mischief, in conjunction with Philadelphia Center for the Book. 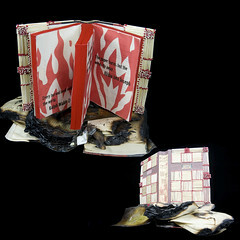 The juried exhibition features contemporary artist books on themes related to banned books, censorship and control. Authors of Mischief features the work of R. D. Burton, Monica Kane, Amee J. Pollack and Laurie Spitz, Jude Robison, and Miriam Schaer. 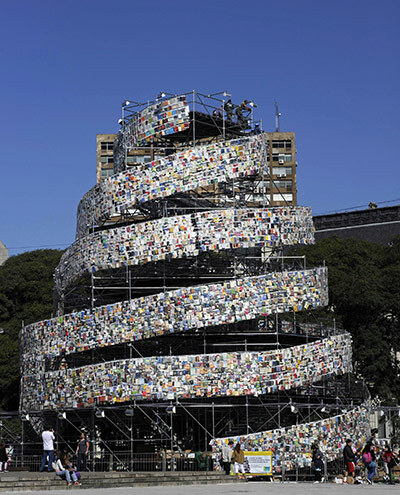 The Tower of Babel, a 35-meter tower of banned books by Argentinian artist Marta Minujin in Buenos Aires. And should you live in Michigan, the Kalamazoo Public Library is having a Banned Books Art Contest. Work is due on October 5. Artists must be MI residents. Two categories—junior (grades 7-12) and senior (over 18). Thanks to Sharyn Moore for a noticing that the books in the Tower of Babel were not in fact banned but donated by readers, libraries, and more than 50 embassies around the world. The reason for my confusion was that her first large book installation did use banned books. In 1983, she used 30,000 banned books to create the Parthenon of Books after Argentina returned to democracy after 7 years of a dictatorship. After the three weeks, the installation was dismantled and the newly-unbanned books were distributed.